Spanish 21 is a popular American variant of the traditional game of blackjack. Played worldwide and offered in the majority of land-based casinos, it is a quick-to-learn and easy-to-play alternative for when you are looking for something slightly different. 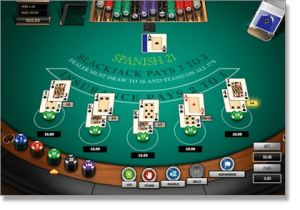 Spanish 21’s two main differences from standard blackjack is a player’s blackjack always beats the dealer’s blackjack, and the game is played with a 48-card Spanish deck, rather than the standard 52-card deck. While the latter change means the four Tens are removed, which introduces problems for players in the form of a two per cent house edge increase, it is offset by some highly flexible, player-friendly changes to the usual rules, and unique bonus payouts which make it a genuinely worthwhile variation to play. Spanish 21 has its origins in Nevada casinos, starting off as a side-game in 1996 before exploding into mainstream recognition. It is officially owned by a gaming company known as Masque Games in the United States, but several unlicensed equivalents are played around the world. One unlicensed version is known as Pontoon, an extremely popular game here in Australia and parts of south-east Asia. Locally, Pontoon — itself a variation of blackjack and Spanish 21 — has eclipsed Spanish 21 in popularity, but the latter is still worth playing for its exciting and favourable rule twists. Fundamentally, Spanish 21 has the same aim as blackjack: to acquire a hand with a greater total value than the dealer, without exceeding 21 points, otherwise known as a bust. It shares the same style of playing table and retains all of the regular blackjack jargon and terminology. 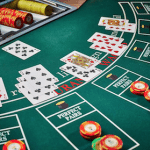 However, it is enough of a spin-off of blackjack with its own bonuses and rule differences to warrant being considered its own independent game. A player’s blackjack or any card total of 21 points always wins, regardless of what the dealer has; a rule which is thoroughly appealing to all players. A blackjack payout is always fixed at 3 to 2. The dealer receives an up-card and a hole card. If the dealer shows an Ace or face card, he/she peeks at the hole card to check for blackjack. If he/she does have blackjack, all players lose (unless they have blackjack). We can opt for late surrender any time, after hitting, doubling or splitting. Splitting is allowed and you can re-split up to three more times, including Aces. We can double down on any number of cards, and can hit or double down after splitting any two cards, including Aces. Spanish 21 is usually played from a six deck shoe, but eight decks are sometimes used. The dealer can either hit or stand on a soft 17, but will usually stand. A major facet of Spanish 21 is the massive bonus payouts awarded to players when their cards total 21: these extra winnings are called Bonus 21. These sort of bonuses, while hard to earn, are fairly rare in traditional games of blackjack, but are present in all games of Spanish 21, which is what makes this variant so popular. If we have five cards from any suit which total 21, the payout is 3 to 2. If we have six cards from any suit which add up to 21, the payout is 2 to 1. If we have seven cards from any suit which add up to 21, the payout is 3 to 1. If we reach 21 with a hand of Six/Seven/Eight, the payout is 3 to 2 for mixed suits, 2 to 1 for same suit, and 3 to 1 for those three cards all being Spades. If we have three Sevens from the same suit, the payout is 2 to 1. If we have three Sevens from mixed suits, the payout is 3 to 2. If we have three Sevens all of Spades, the payout is 3 to 1. Note: The above bonuses still pay out even if the hand was a split, but any doubling negates any potential bonus. If you reach 21 with a three Sevens of the same suit, and the dealer’s up-card is also a Seven (of any suit), the automatic payout is $1000 for bets of $5 to $24, and $5000 for any bets made over $25, while all over players on the table receive an ‘envy bonus’ of $50. Note: If the above hand (Seven/Seven/Seven with a dealer Seven) is made following a split or a hand which was doubled, the bonus is negated. Any other winning hands which do not include any of the above combinations pay out at even money (1 to 1). The coveted suited Seven/Seven/Seven combination with a dealer Seven holds a probability of 1 in 668,382 if the game is being played with six decks, and 1 in 549,188 with eight decks. Every casino also employs their own modifications to the super bonus: sometimes this can mean smaller payouts or additional criteria to acquire it, so read up on each venue’s unique guidelines before playing. Some games of Spanish 21 incorporate an additional side-bet known as Match the Dealer. This side bet is unique to Spanish 21 and applies if either or both of our first two cards dealt match the dealer’s up-card. With a house edge of three per cent, it eclipses the house edge of the main game, but Match the Dealer still has one of the lowest house advantages of any blackjack side bet. We draw a Seven of Clubs and a King of Hearts, and the dealer draws a Seven of Spades, this is called one non-suited match. If we draw a Seven of Clubs and a King of Hearts, and the dealer draws a Seven of Clubs, this is one suited match. If we draw a Seven of Clubs and a Seven of Hearts, and the dealer draws a Seven of Spades, this is two non-suited matches. If we draw a Seven of Clubs and a Seven of Hearts, and the dealer draws a Seven of Clubs, we call this one non-suited match and one suited match. And finally, if we draw two Sevens of Clubs, and the dealer also draw a Seven of Clubs, this is two suited matches and holds the largest payout. The payout and house edge for a non-suited matches and suited matches depends on the number of decks used. 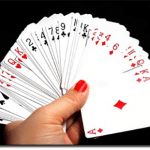 The match the dealer side wager holds a house edge of 3.06% in a six-deck game, and 2.99% in an eight-decks game. If six decks are in play, and the dealer stands on a soft 17, the house edge is 0.37%. If eight decks are being used, and the the dealer must stand on a soft 17, the house edge is 0.38%. If eight decks are in play, and the dealer is required to hit on a soft 17, the house edge is 0.80%. If re-doubling is allowed where the dealer hits on a soft 17, the house edge is 0.42% in six-deck games, and 0.45% in eight-deck games. If surrendering is not an available option, the house edge increase by 0.006% in a stand on soft 17 game, and by 0.018% in a hit on soft 17 game. Spanish 21’s unique Super Bonus also reduces the house advantage, depending on the number of decks used and the wager amounts placed. In a six-deck game with bets of exactly $5 or $25, the Super Bonus lowers the house edge by 0.030%, and 0.036% in an eight-deck game, assuming there are no other players. At a bet of $5, the ‘envy bonus’ also lowers the house edge by 0.0015% in a six-deck game, and 0.0018% in an eight-deck game, per additional player. Insurance bets remain a sucker bet, just like in any other game of blackjack. In Spanish 21, such a wager actually presents worse odds than other games, due to the removal of the four ten-valued cards per deck; a dealer natural blackjack thus much less likely. With a house edge of 24.7% and an unfair payout of 2 to 1 rather than 3 to 1 to match the increased risk in Spanish 21, insurance continues to be one of the poorer wagers of any casino game. Spanish 21 holds a different twist on the traditional game of blackjack, for good entertainment value, and refreshment from the usual rules. While the removal of 10-valued cards is concerning, Spanish 21’s generous Super Bonus and other enticing extra payouts, along with the extremely favourable rule of a player blackjack always winning, are good enough rules to make the game worth playing.